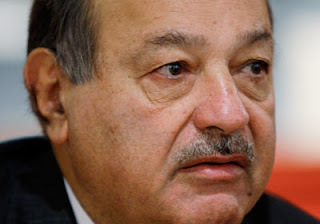 Carlos Slim Helu, $73 billion. Mr. Slim is a Mexican of Lebanese descent. He is the chairman of Telmex (THE phone company in Mexico). He also has holdings in other Mexican industries and the telephone industry in other Latin American countries. How can this man, in a country like Mexico, be the richest in the world? It speaks volumes about the gap between the rich and the poor Mexico, Latin American and the rest of the world. TelMex has been an impediment to the implementation of technology, even though TelMex is part of one of the industries (phones) which is going through the most innovation in the world. If you ever find yourself in Mexico trying to dial out of country, you are out of luck, Mr. Slim wants to make sure he nickels and dimes (and quarters) you. Bill Gates, $56 billion. American. Co-chair of the Bill and Melinda Gates Foundation. The co-founder of Microsoft Inc., the company which did more than any other to help get the world acquainted with the "personal computer" during the 1990's. Warren Buffet, $50 billion. American. CEO of Berkshire Hathaway. Berkshire Hathaway is conglomerate of insurance, energy, retail, and finance companies (i.e. GEICO, Fruit of the Loom). Very minimal impact on technology. This is a bread and butter conglomerate, stays out of the "blue chips". Bernard Arnault, $41 billion. French. Charmain of Louis Vuitton Moet Hennessy (LVMH). LVMH is a conglomerate of around 60 luxury companies (i.e. Louis Vuitton, Hennessy spirits, Bulgari watches, TAG Heuer). Interesting to note, Christian Dior owns 42% of LVMH. Anyways, this company is the definition of anti-technology. All luxury. Larry Ellison, $39.5. American. Oracle CEO. Oracle is a software company that focuses on databases. For the average person, Oracle technology is not interesting. However, you would care about their products, if you owned a business. @OscarA, I mostly agree with you, I was generalizing too much with LVMH. Cars are a perfect example of how luxury can be fused with technology. I guess a good way to break down if a company is technology driven, is by looking at their R&D department. There probably isn't a large percentage of resources devoted to R&D in the luxury perfume, hand bag, and even watch industries.